Were Gods Meant to Entertain? 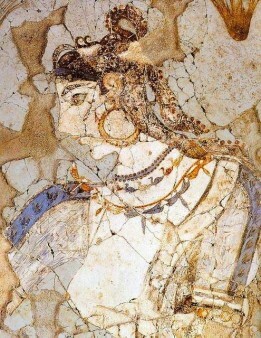 «The Mistress of the Animals», from Xeste 3, on Akrotiri. “Were Gods Meant to Entertain? Exploring Performativity, Theatricality and Entertainment in the Aegean Bronze Age Religion” is the title of the lecture to be given by Elene Balomenou (University of Athens), on Tuesday, April 21st 2015, at 15:00, at the Swedish Institute at Athens (Mitseon 9, Akropolis metro station), in the framework of the Athens Greek Religion Seminar. «The religious cult in the Aegean Bronze Age has been thoroughly explored by the study of the available iconographical and architectural data of the Minoan and the Mycenaean material culture, by its extensive comparison with other contemporary prehistoric cultures and evidently by its relation to the posterior ancient Greek religion» explains E. Balomenou in the abstract of her paper. »Subsequently, in light of the various theoretical patterns and of the recent disciplines emerging in the past century, the Aegean Bronze Age religion was developed as a component of socioeconomic investigation while the remaining evidence of its ritual practice was observed at some length in the field of anthropological interpretation. Since this religious ritual practice has been highlighted as religious ritual action, the foundations have been laid in order to extend our notion of the Aegean Bronze Age religion and situate it as center of live experience, demonstration activity and subsequently as the scenery of a staged spectacle and display. »The aim of this paper will be to point out the dialectic infusion among these dimensions, which seems to source as religious symbolic action but could as well flow as a vivid entertaining performance».